Robotics has evolved considerably over the past 70 or so years, becoming ever more capable, efficient, reactive, flexible, and precise. This robot precision is be the key to future applications. The earliest industrial automation took on repetitive tasks that didn’t require high precision, such as painting car doors. As motion control, actuators, and other technologies progress, industrial robots can complete a broader range of tasks. From materials handling and machine tending to working alongside humans in pick-and-place operations, robot precision is transforming the manufacturing, medical, and logistics sectors, among others. We asked three industry professionals about how robot precision has improved over the years, and what it needs to continue growing. First, we must address the differences between robot precision and accuracy. Technically, no robot or manufacturing process is 100% accurate, he said. There’s always some margin of error. The average positioning error of a robot determines its accuracy and the kinds of tasks it can perform. Over time, this average error has decreased dramatically due to various technological improvements. “The main factor affecting precision in an industrial robot is the gearboxes in its joints,” said Bonev, who noted that factors like encoders and the rigidity of a particular arm will also affect robot precision. However, these are already fairly accurate or easy to improve, he said. Because Mecademic’s Meca500 is so small and rigid compared with other industrial robots, it is the most precise six-axis industrial robot arm, he added. The longer a robot arm is, the larger the effects of errors in the gearboxes, according to Bonev. Thus, as miniaturization benefits everything from cellphones to industrial and service robots, robot precision has been able to increase. Earlier technological advancements included using a laser tracker to increase accuracy. This tracker can measure the position of the robot arms, compare it with a programmed position, and then correct any error it detects. The robot can perform these checks on a regular basis — often many times throughout completing a task — compensating for any errors and resulting in an overall more accurate system. To improve accuracy, robot manufacturers and operators also need to consider external factors that may have an effect. These variables include payload and vibration. A concrete foundation can help reduce vibration and keep robot arms steady. To avoid errors from excessive vibration, energy must be transferred through the robot’s foundation and into the floor. Otherwise, it can harm robot precision. The arms also need to be designed in a way that reduces vibration. Software also plays a role, as it controls the robot’s movements. Developers often run multiples of an automation software program to ensure accuracy. In some cases, the software may need to make corrections for problems that arise. A laser cutting robot, for example, might need to slow down to cut around a corner, but going slowly allows more heat to build up. The robot would have to be programmed to reduce power when it slows down to reduce heat. Today, robots are accurate enough to perform wire welding along a seam, a job in which position, speed, acceleration, and deceleration all matter. They can even perform laser welding, which typically requires extreme precision. For example, Germany-based Weller’s automated soldering options are able to precisely control everything from the angle of the soldering iron and the temperature to the speed and amount of solder fed into each joint. “It’s this number of highly controlled variables that results in a precise soldering process,” Gardener said. However, this level of robot precision has been at close to today’s level for a while. That’s not to say that precision in robotics today isn’t good. It is, in fact, very good. As an important component in the success of robotics, robot precision and accuracy were honed relatively early in hardware and software development. Such industrial robots still function well, even in many of today’s advanced automation applications. 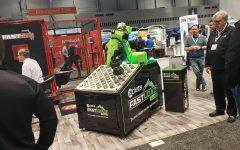 Mathieu Bélanger-Barrette, senior production engineer at collaborative robot company Robotiq, pointed out that core subjects like robot precision don’t undergo much innovation over time, even though the robotics industry as a whole may seem to be advancing rapidly. Although robot precision might not be as big of a deal for cobots as for other automation, Bélanger-Barrette said that cobots now have more sensors to make sure that they are accurately perceiving their environment, making them more precise. “They have sensors to tell them what force they are applying on a certain surface, but also sensors that allows them to see what kind of part they are going to grab,” he said. Bélanger-Barrette said he thinks that not only will robots become more position-accurate, but they will be able to better interpret their surroundings. This development could be “the game-changer in future robotic applications,” he said. Despite a slow rate of innovation, robot precision has come a long way since the early days of industrial automation. Today, robots increasingly assist in sensitive surgeries. A hospital in the U.K. has tested a robot that can perform a delicate eye surgery. The study found that the robots were 10 times more precise than a human surgeon. The robot can make movements that are accurate within 1 micron. As technology progresses, robots are becoming even more precise — and more commonplace. The global robotics market is expected to increase to approximately $67 billion by 2025, up from about $15 billion in 2010. Today’s robots of today can perform much more detailed work than their predecessors. The cobots and service robots of the future will be able to do complex tasks more accurately than humans can, agreed the experts.